Over the last few months purple cauliflower has been popping up at all the farmers markets over here in Perth. The first time a bought one I was so excited & wanted to do something extra special. 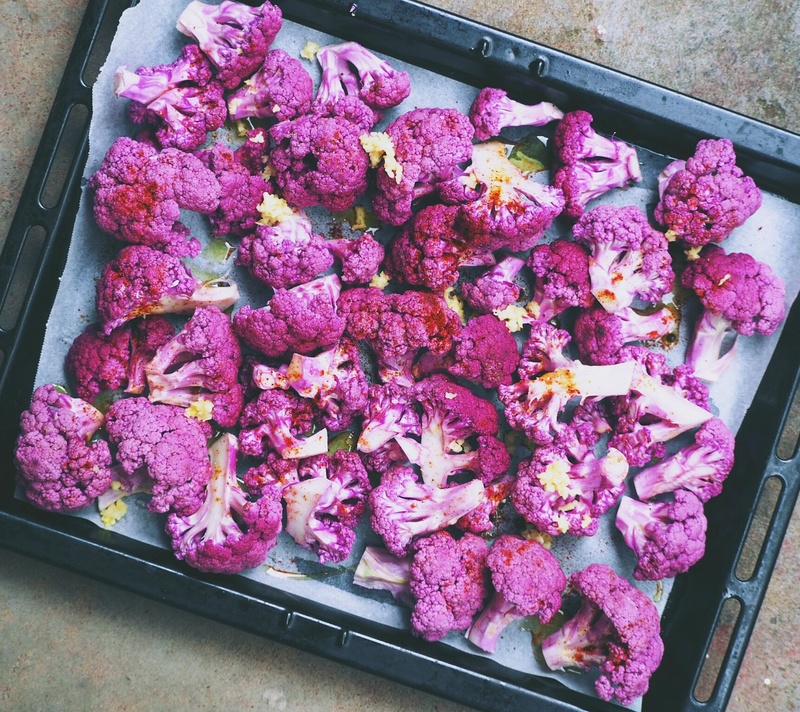 It ended up sitting in the fridge for two weeks while I dreamed up all these crazy things I could do with this purple cauliflower cauliflower. In the end I used it in a rush one busy weeknight when I was craving some comfort food. 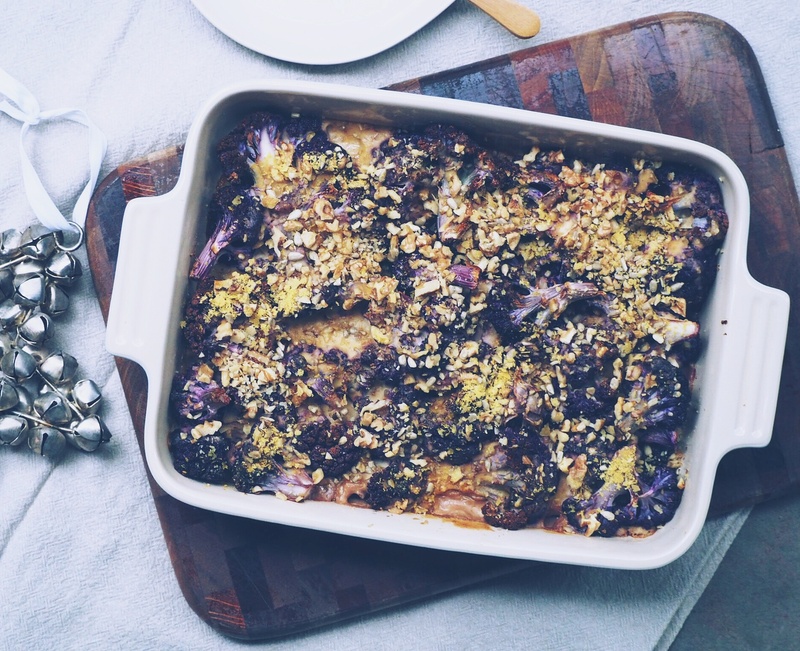 The cauliflower was roasted with garlic before being baked with a fish and creamy sauce made from almond milk. Surprisingly, it was an amazing dish that was gobbled up by all, especially my sister. She would have eaten the whole tray right then. Luckily some was left for our lunches the next day! Since then we’ve had this cauliflower cheeze on regular rotation & every time it is thoroughly enjoyed. I’m thinking of serving this on Christmas eve and even though it’s quick & easy to make, it tastes indulgent. 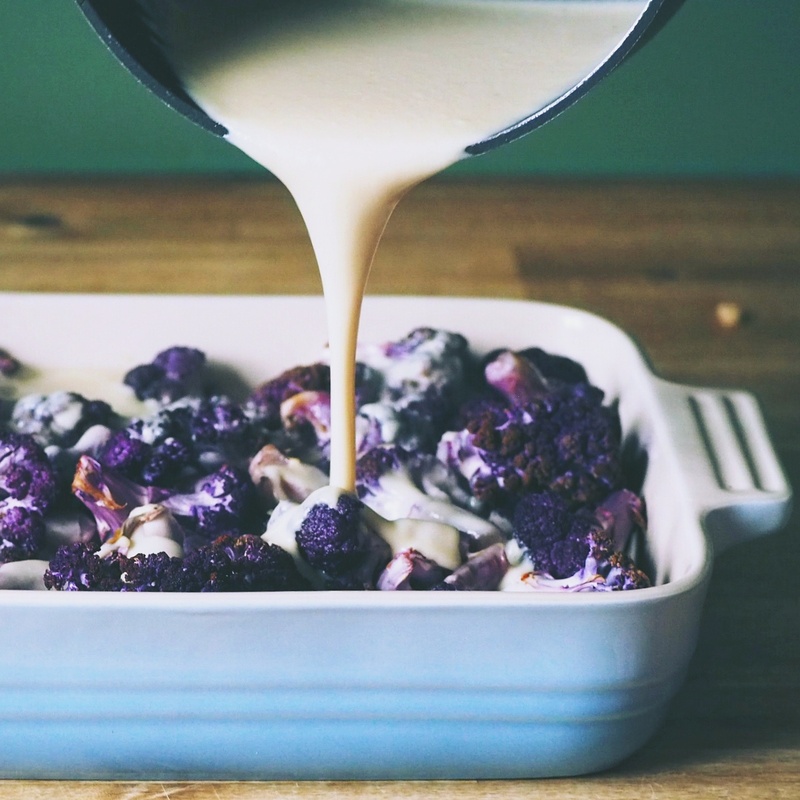 By using purple cauliflower there’s a healthy does of anthocyanins which have anti-innflammatory & antioxidant benefits. Regular cauliflower is also high in vitamin C so no matter what colour you choose its bound to be healthy & nutrient rich. Trim the cauliflower & cut into medium sized florets. Line a baking tray with baking paper & place the cauliflower on in a single layer. Drizzle with 2 tbsp of the olive oil, sprinkle over the crushed garlic, paprika & season with salt & pepper. Place into the preheated oven for 20-25 minutes. Meanwhile prepare your béchamel sauce by heating the remaining 2 tbsp of olive oil in a small saucepan. Add the chickpea flour and stir until a thick paste forms. Now, with a whisk in hand, gradually add the almond milk, whisking continually to ensure no lumps. Over a medium heat gently bring to the boil, while whisking every so often. It will take about 10 minutes for the sauce to thicken. Once thick add in the miso & nutritional yeast. Give the sauce a final whisk before taking off the heat. 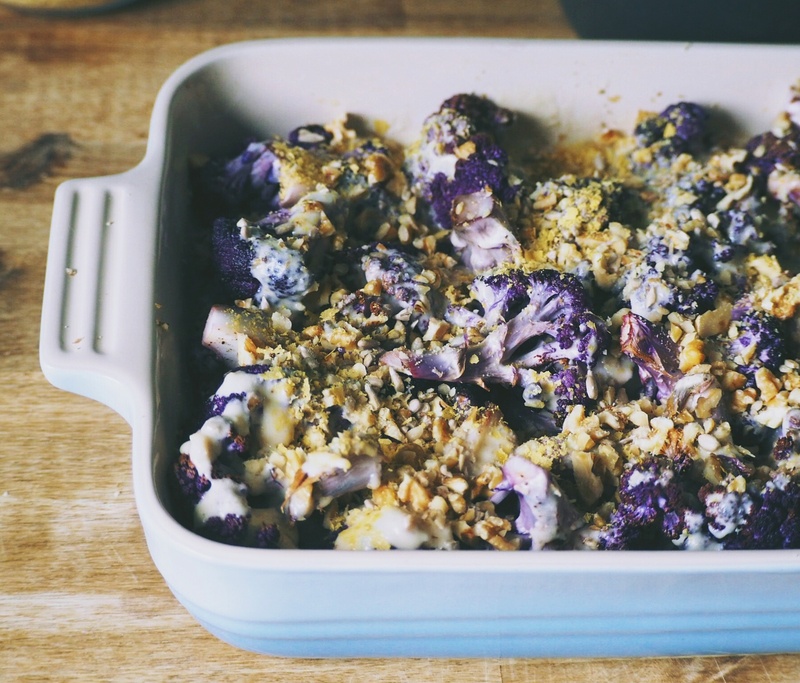 Remove the cauliflower from the oven & place in a baking dish. Pour over the béchamel sauce & top with the walnuts, sunflower seeds & remaining nutritional yeast. Season with a little extra salt & pepper & baking at 200 degrees celcius for 30 minutes.